It’s been almost a week since the tragic news about Steve Jobs’ passing hit us and one thing that’s particularly impressive is the overwhelming response by people all countries regardless of their political or other affiliations. On Twitter, some say the responses reached 2.5 million tweets for 13 hours. Jobs was truly a uniting figure, one that won’t be fully replaced neither by Tim Cook, nor by Phil Schiller or any other single person at Apple. But Apple’s former chief executive had an adventurous career, full of ups and downs. That’s the exact spirit of Jobs, his legacy, dare being yourself, “staying hungry and foolish.” Jobs was against the narrow minded, the technology solely for the technology kind of thinking. “I wish him the best, I really do. I just think he and Microsoft are a bit narrow. He'd be a broader guy if he had dropped acid once or gone off to an ashram when he was younger,” Jobs wasn’t afraid to comment on Bill Gates. That all-around human essence was in the core of Jobs, but it didn’t mean that he was messy. He’d concentrate on a single thing. “And it comes from saying no to 1,000 things to make sure we don't get on the wrong track or try to do too much,” Jobs said for BusinessWeek in 2004. And now the infographic on the right shows you all the details about the iCEO in a neat and simple way. 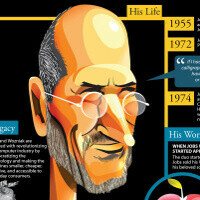 Check it out and feel free to share your thoughts about what was the thing that you looked most up to in Steve Jobs. Yes you do, you get a life time supply of............................................................ Cracker Jack! YESSSSSSSSSSSSSS! I already know this! It's only the same thing posted now for like fifth time since his death on PhoneArena.com. I think by NOW we all know the man’s achievements ESPECIALLY if we read this site on a consistent basis. I like the illustrations though! Dude he is no "GOD", he is a man just like you & I. He took a piss like you & I. He put his pants on like you & I. Please, buddy you sound like a clueless, brainless fanatic. Steve Jobs was a genius, NOT A "GOD"! You must be from The Church of Shepherd Steve Jobs of Latter-day iSheeps! Dude don't SOIL Steve Jobs legacy like that. He was a visionary & true talent in the tech world, by no means is he a "GOD" so get real! Did Steve Jobs really invented, designed and created the iPhone, iPod and iPads? He co-founded Apple but it doesnt mean he invented everything under the Apple brand. By all accounts he was the driving force behind those major innovations. He may not have known exactly what it would look like, but he knew what it should do. The best bosses inspire employees to do great work for them. He had a great mind. And apparently had a decent sense of humor. That's all I've got.